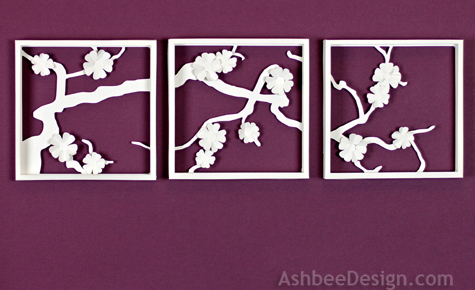 A natural theme to follow bamboo paper shadow boxes for me is a branch of apple blossoms. Years ago I had a co-worker that spent hours practicing Chinese Brush painting and she specialized in two compositions - bamboo and apple blossoms. 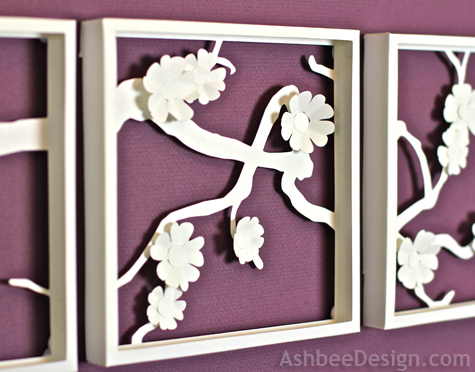 Once I had completed my bamboo shadow boxes using my Silhouette cutter, I knew my next exploration would be apple blossoms. This one took me little longer to create a composition that flowed naturally. I knew it had to be a horizontal motif because of the subject matter. I think this tryptic would look lovely on the wall at the head of a double bed covered in a white duvet and piled high with lacy pillows. I also varied my technique with this design. 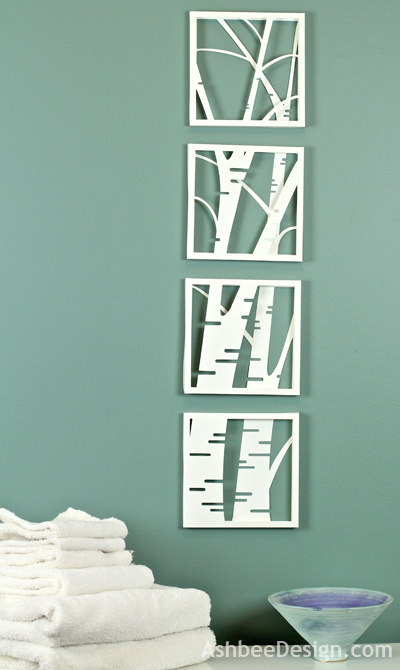 The branches are all on one level whereas with the bamboo and birch projects I used two levels. But in this design I crafted each blossoms individually and affixed each to the branches to create added depth. I am thinking of tinting the blossoms every so slightly with pick watercolor. Here are my other two variations of this technique. I expect more to come! 6/11/2013 Update! The cutting files for this project are now available at the Silhouette Online Store here and a tutorial for using the file is located here. Hope to see you there as well! I Saw this one Facebook and my immediate comment (out loud) was "Oh my goodness Mom!" These are beautiful. However, I happen to know you don't have a wall that shade in your house. How did you take the photos? You haven't seen your bedroom in awhile, have you? 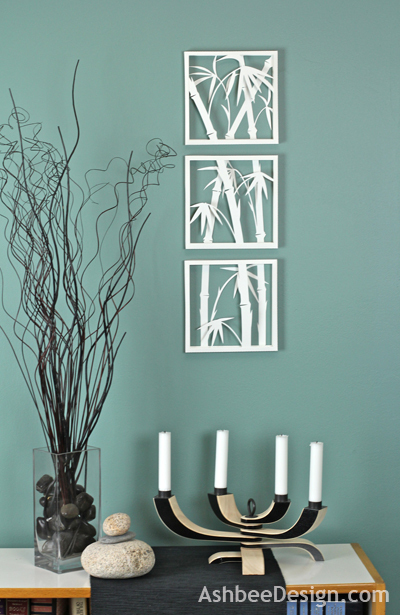 :-) Glad you like the shadow boxes. These are awesome! I like the blossoms best. I take this as vote two for the apple blossoms. Thanks for visiting and voting. Oh my, these are lovely! The apple blossom is my favorite. Very cool project! Hope you can stop by the enchanted oven to say hi. These wall art pics are really nice. Good job on them! Those are so pretty and elegant! They're just gorgeous! I love the apple blossoms! You are awesome - these look so pretty! 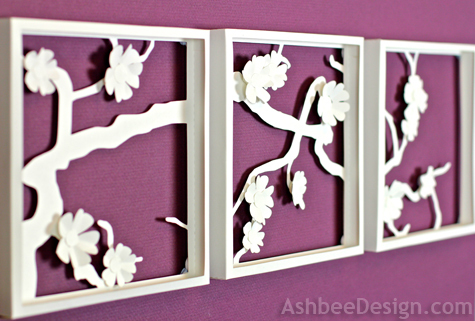 Wow - the apple blossom wall art is my favorite yet!! So lovely. Thanks for sharing this at Romance on a dime!! I think I like the bamboo ones best but the apple blossoms are unique because of the horizontal orientation.